The Omega Supercharger SC-3 is a compact and portable compressor, ideal for refilling your airgun, or topping up your dive bottle. The unit is very easy to use, comes with all the necessary tools to maintain it, and shuts itself off once achieved the desired pressure. The unit is capable of charging up to 4500 PSI making it an ideal choice for the avid airgun enthusiast who regularly needs compressed air, but doesn't enjoy the long trips to the dive centre to refill the tank. Powered off a standard 13 amp socket it requires no special power supply and can easily be moved from location to location. 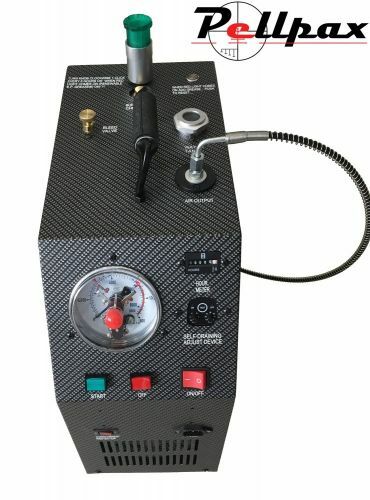 A large dial on the front of the unit can be set to the desired pressure, and once that has been reached the unit stops itself to avoid overcharging. It also has an automatic venting system which removes moisture build up every at programmable intervals to ensure all air is as dry as possible. Fill time is between 3 - 4 minutes for a rifle, and 45 mins for topping up a diving cylinder (dependant on size). This latest model from Omega is 4KG lighter, is quieter than before, has upgraded internal seals, and has a new greasing system with a timer to remind the operator to screw more grease into the machine. Package Contents: Maintenance kit, Purple Ice lubricant & Antifreeze, a high pressure hose with quick connect, a manual, a cover and a 1 year warranty.